1. How long does it take to learn to surf? Most of our students pick up the basics (riding small white water waves, while standing on the surfboard) in their first lesson but everyone is different. Practicing sports like swimming, yoga, gymnastics, skateboarding and snowboarding are an advantage, but not necessary. The best form of training for surfing – is to surf as much as possible. 2. How much does a surfing lesson cost? 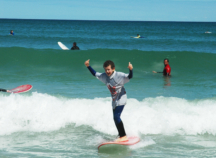 All the LEARN 2 SURF schools charge different prices. 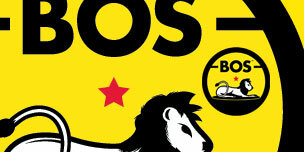 Click on your preferred school/location to view their products and prices. 3. What age can you start surfing? Youngest: As a general rule, we say that we coach kids from 6 years old. Some of our schools coach children as young as 4 years old. It all depends on the child (how keen they are to surf and how comfortable they are in water/the ocean) and the surf conditions at the beach you’d like to surf at. Younger kids require extra attention – so we recommend one-on-one coaching (private lessons) for them. Oldest: Some of our schools have coached students who decided they wanted to learn to surf in their 70’s! Don’t feel like you’re too old to surf – ‘if you think you can, or you think you can’t, you’re usually right’. 4. Do I need my own surfboard and wetsuit? NO. All of our schools supply all the equipment you require. You only need to bring a bathing suit (boardshorts/bikini), a towel and waterproof sunscreen. 5. How do I Book A Lesson? Click on the BOOK A LESSON button at the top of every page and Request a Lesson. We will respond to you as soon as possible to confirm your booking details. If we cannot accommodate your request – we will suggest alternative days/times. As soon as you are happy with the booking details – you need to confirm your booking, by paying online. We will send you a link to pay online (or our banking details if you have a South African bank account and would like to pay via EFT). Your booking will be confirmed as soon as your payment has been received. 6. Do you still have lessons if it is raining? Yes we do! Surfing in the rain is awesome! And – you will get wet while surfing so rain is no reason to cancel a lesson. The only time we will cancel lessons is if the weather conditions make it too dangerous/unsafe. We will NOT coach you in un-safe conditions! We will check the weather forecast a few days before your lesson day and contact you in advance to reschedule your booking, if necessary. 7. Where are you located? Our head office (with the guys who handle all the bookings and payments, for ALL the Learn 2 Surf schools) is based in Muizenberg, Cape Town. When you book or buy a lesson, they will send you details of exactly where and when to meet your instructors for your lesson – as well as your instructors cellphone number, just in case you get lost on your way to the beach. 8. Can I pay in cash? All lessons need to be booked and paid for in advance – via this website. As soon as your Booking Request details are approved, we will send you a link to pay online with your (Mastercard or Visa) credit card. If you have a South African bank account, you may pay via EFT. Your booking will be confirmed as soon as your payment is received. 9. What is your refund policy? If you do not arrive for your lesson, you will not be refunded. If you cancel less than 24hrs before your lesson time, you will not be refunded. If you need to cancel your booking, and you do so more than 24hrs before your booking time, you will be refunded 90% of your booking cost (booking cost – 10% admin fee). 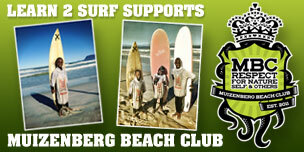 ‘Surf Lesson Vouchers’ : Any product/s bought on this website (Learn2surf.net) via the Buy A Gift Voucher page. ‘Surf Lesson Lesson Credits’ : Lesson credits from multiple lesson packs or from lessons we’ve had to cancel and thereby credit you for. • are valid for 3 months (or until the expiry date printed on the voucher). • must be redeemed/used before they expire. 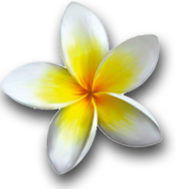 • are not transferable (they are only to be used by the person whose name is printed on the voucher). • are not to be shared between multiple surfers. • are not refundable partially or in full. Please do not wait until your voucher is about to expire before booking a lesson. (Bad weather can happen and it would be a shame if the weather conditions don’t allow you to surf before your voucher expires). The sooner you contact us, the more time we will have to ensure you can surf on the days with the best conditions – and there will be no chance of your credits/voucher expiring. 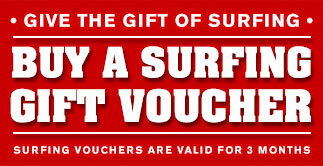 IF YOU BUY SOMEONE A SURF LESSON VOUCHER – PLEASE ENSURE THEY ARE AWARE OF THE EXPIRY DATE. The closer together your surf sessions are – the faster you will improve your skills. Try not to leave too much time between your surfs. Consecutive surf days are best! (if possible).